A federal judge came down on Corinthian College Wednesday, ruling that the shuttered for-profit school is liable for $531 million in student loans. The school misled students about their future job prospects, and lured thousands to take out high-interest, private loans in order to enroll in one of its programs, according to the lawsuit brought by the Consumer Financial Protection Bureau over a year ago. The school itself served as the debt collector for these loans, and was found to have strong-armed students to pay them back, sometimes pulling them out of class or denying them computer access if they hadn't paid up. Although the company was found liable, it won't be able to cover the $531 million since it entered bankruptcy earlier this year, the CFPB said. It's unclear whether the 115,111 former students with these private loans will still be left footing the bill. For now, they can file a complaint with the CFPB. "We all have much more work to do before current and past students who were hurt by Corinthian's illegal practices can be made whole," said CFPB Director Richard Cordray in a statement. Corinthian's private loans came with interest rates as high as 15% in 2011. At the same time, a student could get a federal student loan with an interest rate between 3% and 7%. More than 60% of Corinthian students defaulted on these loans within three years, according to the CFPB. 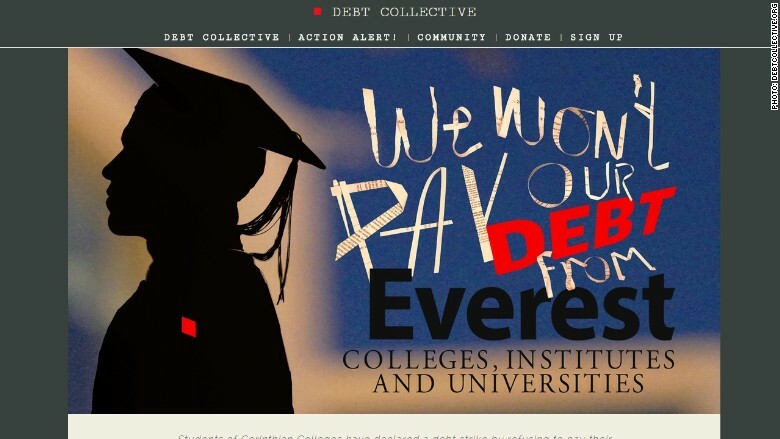 Some of Corinthian's former students have been refusing to pay back their loans ever since the school closed its doors and filed for bankruptcy in May -- and many may see their loans forgiven. The Department of Education has set up a fast-track process for those with federal loans. Those who were enrolled when their school closed can apply to have their loans wiped away. And if they had already completed the program, they can still apply for forgiveness if they believe they were victims of fraud. Since 2010, close to 350,000 students took out federal loans in order to attend a Corinthian College, totaling about $3.5 billion. Those with private loans administered by Corinthian have already been promised a 40% reduction in their loan balance, thanks to an agreement between the government and a company that acquired some of Corinthian's campuses. The company is paying off a total of $480 million of the student's outstanding debt. This isn't the first win for the federal government in its crackdown on Corinthian College. The Department of Education fined the school $30 million in April after it found that it was overstating job placement rates for graduates. The school is also facing lawsuits from several state attorneys general. Founded in 1995, Corinthian's network of for-profit schools once included 100 campuses across the country, where about 74,000 students were enrolled. The schools operated under different names, including Everest, WyoTech and Heald.